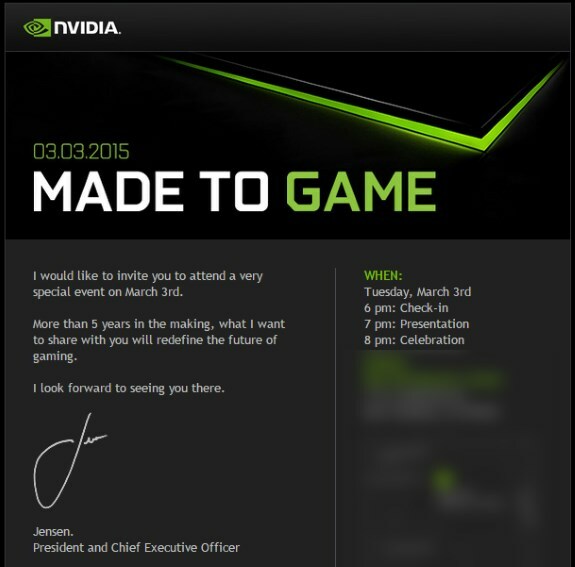 NVIDIA is sending out press invites for a special "Made to Game" event on March 3rd, just before the start of the Mobile World Congress. As is typical, the invite is light on details but suggests it's a new mobile gaming device. NVIDIA claims this new product has been more than 5 years in the making and promises it will "redefine the future of gaming". There's not a lot of information but the rumor mill claims it could be a new Shield tablet with a virtual reality (VR) component to it. NVIDIA has been up to big things lately, their latest chipset on the market, the Tegra K1, has been running very well in devices like the Nexus 9. The successor Tegra X1 was announced at CES in January, expanding the availability of high-end 64-bit mobile processors on the market.